I´ve been going to Nebraska for a few weeks almost every year of my life. One thing I remember strongly from when I was a kid was visiting the American school. Exciting and nerve wrecking at the same time. This year Viola got to go to her cousins school with her aunt to talk about how we celebrate Christmas in Sweden. She was dressed as Lucia and handed out gingerbread cookies. They talked about how dark it is in Sweden this time of year and that Santa actually comes to the house on Christmas Eve and hands out the gifts. 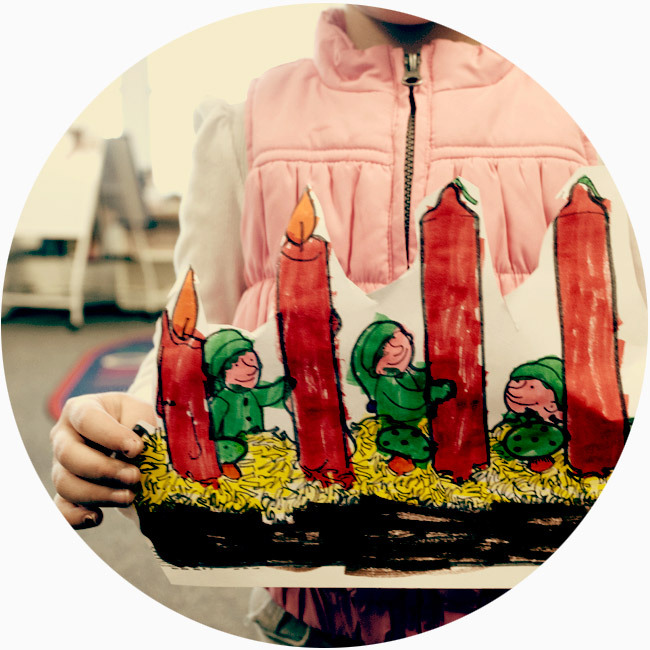 Viola´s dad had made a drawing of an advent candle holder for the kids to color. Viola was very nervous on the way there but dealt with it like a true champ. ååååååhh vad fina dom är!!! As a teacher, I’m especially happy to read this. I’m sure Viola did great and her presentation left a positive, lasting impression. Cross-cultural learning opportunities are wonderful, and I think it’s activities like this that people remember best! As I posted this I wondered to Myself if we have any teachers as readers. Ah! this is such a great experience for everyone involved! i was wondering, does viola speak a lot of english? it always amazes me how well the kids i meet in sweden and norway speak english from a young age! Yes. We are amazed as well. Viola picks up more and more every day. She plays with her american cousins and she talks to alot to grown ups. She always get them to understand somehow. She even order her own food yesterday At a café. Kids are more fearless- not afraid of saying the wrong thing- like grown ups.